I’ve come late to this recording. My colleague, Dan Morgan recently made his review copy available for David Dyer, Len Mullenger and I to sample in the MusicWeb Listening Studio. Viewing the whole of Part I, we were seriously impressed both by the performance and by the way it has been captured by the audio and video teams. Subsequently my daughter gave me a copy for my birthday and that has enabled me to experience the performance in more detail. I must admit to some ambivalence towards Dudamel, not least in Mahler. In late 2013 I saw him conduct the Seventh Symphony in Birmingham and was not wholly convinced (review). A few months earlier I’d come to the conclusion that his recording of the Ninth Symphony was something of a work in progress (review). That recording was taken from live performances with the Los Angeles Philharmonic and, looking back, I see that the Ninth was the product of concerts given at around the same time as this performance of the Eighth. I will say straightaway that there is no need for equivocation about this live Eighth; it is, quite simply, the finest thing I’ve ever heard or seen Dudamel do. 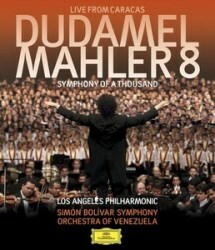 The Eighth was the pinnacle of a series of performances of all the Mahler symphonies that Dudamel conducted in both Los Angeles and Caracas at around this time. Goodness knows how long the venture to perform the Eighth was in the planning. Choral rehearsals, for instance, must have been months in the planning and a great logistical challenge to coordinate. Dudamel combined the two orchestras that he leads, which is in itself quite remarkable but it’s when you see the serried ranks of singers behind the orchestra that you appreciate the sheer scale, the ambition of this performance. A large number of Venezuelan choirs were combined, all of them, I believe, part of that country’s famed El Sistema. All the singers involved appear to be young. We read in the booklet that Lourdes Sánchez, the choir mistress charged with assembling this vast choir, lost count of how many singers took part, guessing that the final tally could have been between 1200 and 1300. For once the nickname ‘Symphony of a thousand’ seems justified – or even inadequate. Not the least achievement here is that the performance never seems like a musical behemoth. Yes, the moments when the whole cohort is at full stretch are mightily impressive – one can only speculate at the impact in the hall itself. However, the many moments of delicacy are handled with sensitivity and finesse. This is a real Mahler performance, not a Barnum and Bailey event. I’ve sung in several choral performances involving large forces and/or in resonant acoustics – the Teatro Teresa Carreño is an impressive modern hall where undue resonance is not an issue, I suspect – and I know how difficult it can be to keep with the beat. The rearmost ranks of this huge choir must have been at a considerable distance from Dudamel yet, to their great credit, I never felt that the performance was dragging or ragged; on the contrary, it’s impressively taut. It must have been a huge physical effort for Dudamel to lead all these forces and he could have been forgiven for “merely” beating time in order to control and coordinate everything. Yet he does much more than this, actively shaping and moulding the performance most impressively and revealing a full command of Mahler’s score. He’s greatly assisted by an acute response from the combined orchestra. They play with impressive power and unanimity but just as impressive is the finesse in passages such as the extended opening to Part II; throughout the performance the instrumental solo work is a constant source for admiration. The soloists are very impressive. My first impression in the Listening Studio was that the soloists were recorded rather too closely. I no longer feel that way; they are no more prominent than you would experience when listening to a studio recording. Alexander Vinogradov is an imposing Pater profundus while Brian Mulligan gives an impassioned account of the Pater ecstaticus solo. I’ve heard sweeter-toned renditions of some of the tenor solo passages but Burkhard Fritz is fully equal to the cruel demands of Mahler’s writing and acquits himself very well. Among the ladies Anna Larsson is very fine while Julianna Di Giacomo excels in the Gretchen role. In the big moments such as the end of Part I she and fellow soprano, Manuela Uhl soar thrillingly into the heights. Kiera Duffy has the taxing role of Mater gloriosa. It’s only a short role but it must be a nightmare to start that first cruelly exposed, high phrase ‘cold’. Miss Duffy sings from a balcony high up to the conductor’s left. It might be thought a touch theatrical that she should be bathed in gentle golden light and that a camera should focus on her as she makes her way to the place from which she is to sing. Well, theatrical it may be but Mahler’s treatment of the Mater gloriosa role is theatrical and as a seasoned operatic conductor himself I suspect he would have approved. Duffy sings beautifully and the overall effect is wonderful. Speaking of effects, at the end of Part I, just when you think that the tumult could not intensify any further Dudamel unleashes his ‘shock troops’: no less than nine trumpeters and six trombonists standing in a balcony behind him and to his left. It’s a “wow” moment and he repeats the treatment at the very end of the symphony. Are there any disappointments? Perhaps there are one or two mild causes for regret. In the accompanying bonus feature we eavesdrop on some rehearsals including an orchestral rehearsal in the Walt Disney Hall, home of the LA Philharmonic, where it’s quite odd – and interesting – to hear the opening of the symphony with no vocal parts. The mighty organ in the hall packs a real punch. Sadly, in Caracas, where I suspect there isn’t a permanent organ, a much less imposing electronic organ has to be used. It’s perfectly satisfactory – until you hear what the LA instrument could have brought to the party. The other slight disappointment is that Dudamel sometimes doesn’t get his choir to sing as quietly as one would have liked. Had the choir sung just a fraction more softly at the beginning of Part II the effect would have been even more mysterious. In this passage too Dudamel gets the choir to sing legato and through the notes whereas most conductors I’ve heard achieve a more pronounced staccato effect. And then there’s the entry of the Chorus Mysticus: “Alles Vergängliche is nur ein Gleichnis.” The choir achieves piano here; had they been able to sing it even more softly the effect would have been heart-stopping. I strongly suspect that these two points I’ve made about the choir are a consequence of having so many singers involved: one or two compromises had to be made. These small points are nothing more than that. This is a formidable achievement by all concerned. First and foremost it’s a colossal achievement by all the performers whose musicality and sheer stamina must be saluted. It’s worth saying that the choirs stood throughout the performance; there simply would not have been room for them to sit down at any time. Their platform discipline is superb. The achievement by those responsible for recording and filming the performance is equally great. The sound is excellent: Mahler’s huge climaxes are thrillingly conveyed, without overload, but also a tremendous amount of detail is captured. As for the video aspect of the production I think that those responsible have pulled off a significant coup. On the one hand they’ve managed impressively to convey the sheer scale of the enterprise and also they’ve been just as good at focusing in on individual performers – and on the conductor, of course; without exception the close-ups are relevant to what is going on in the score at the time. May I make one recommendation? After the performance the applause and credits roll for 8:03. I’d suggest that just once you watch this chapter through to the end. If you do you’ll see from their reactions afterwards just how much this performance meant to the performers. The soloists were all clearly moved. You also see the members of the two orchestras sharing their delight at the success of the venture. Above all, it’s the reaction of the choir members that is most moving; several of them are in tears afterwards and there’s genuine jubilation among all these young singers that they’ve brought it off. This is a remarkable performance and a record, too, of a special event in the annals of Mahler performance. I urge you to experience it for yourself.